It might be because my mom has a gorgeous ring and pendant that are old coins - they are without a doubt the most beautiful pieces of jewelery I have ever seen. It helps that they are family heirlooms, I'm a sucker for sentimentality. Unfortunately I have had very little luck persuading her to give them to me, but I'm sure I'll wear her down one of these days. In the meantime, similar jewelery can be found all over the place! These amazing earrings are available on one of my favorite sites, Etsy, which features handmade goods from artists. Because my birthday is coming up! Seriously, November is not that far away! 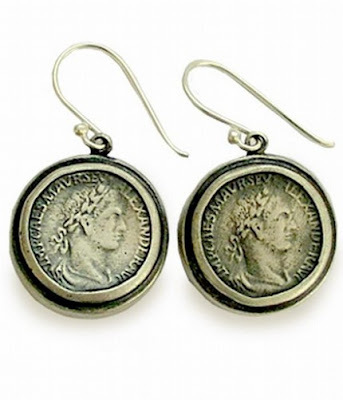 I really do like you coin jewellery.